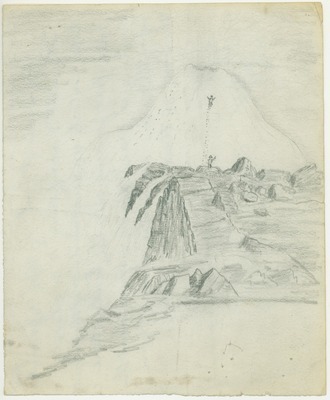 Note on verso: "Ice cone at foot of Upper Yosemite fall. The test description is necessary to the artists understanding of the subject, water fall pouring into the hollow cone making a great spray and wind about the top of the cone. The water issues from the base in three separate falls." Studio copy of a field drawing adapted from 1873 journal page 31.